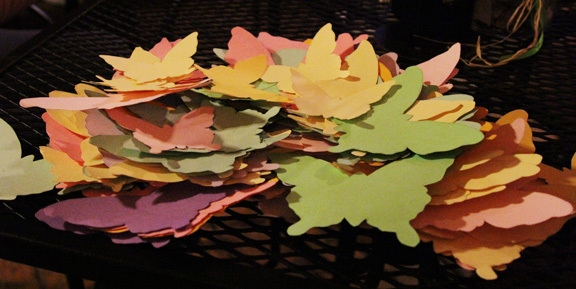 Hundreds of paper butterflies for Forever Innocent! So many projects have sprung up based on my new book, that it’s hard to keep track of them all. 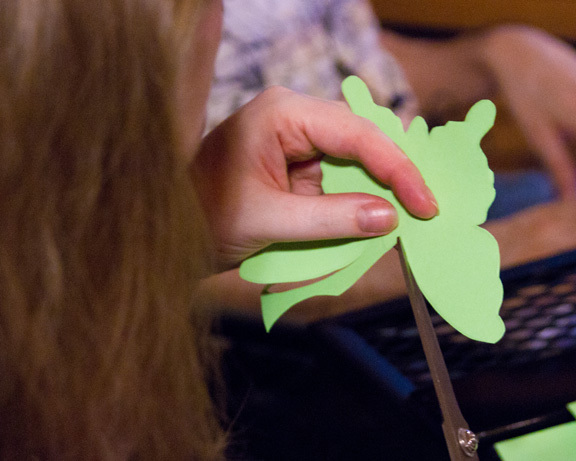 Right now, I’m working on a joint effort of the book trailer and Project Butterfly, a social media movement to place butterflies on the pages of families who have lost babies to show you haven’t forgotten their little ones. 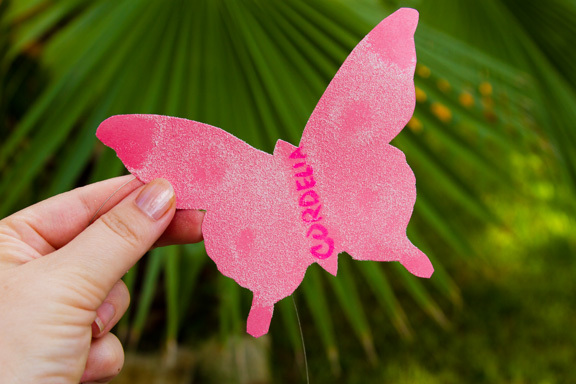 Hundreds of families have given their babies’ names to put on the butterflies that will be featured in the book trailer. We’ll be shooting this weekend, s o it’s your last chance to get a name in! 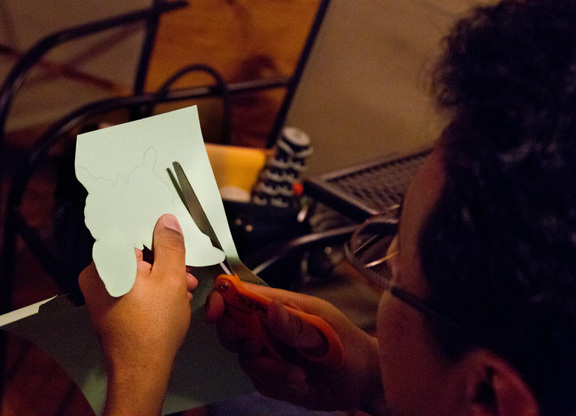 I had a half-dozen friends help me hand-cut the paper butterflies. Then I sprayed them, added the names, and we have begun the process of stringing them to prepare for the scene where Corabelle, the main character, walks through them as she did in the novel. We’ll be shooting in three locations for the trailer. I’m super excited to see how it all turns out! The book won’t be out until Oct. 1, but here is a hint of the scene we will be portraying in the video. Corabelle has told Gavin, who left her four years ago during their baby’s funeral, that she can’t see him again. This is one of the ways he tries to get her back. The blinds to my living room window were closed, so I carefully pushed a couple of the slats aside. Unbelievable. I stepped back a minute to blink, then looked again. 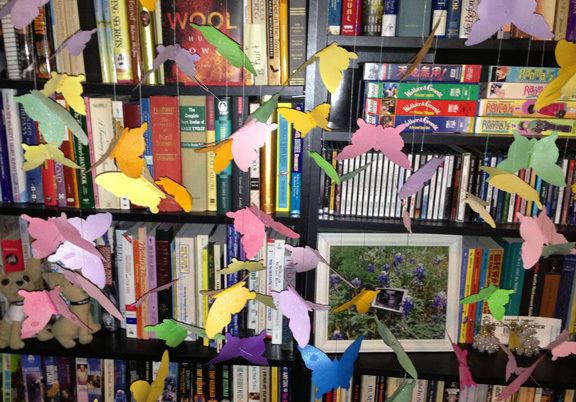 In the trees outside my door, hundreds of colored paper butterflies hung from the branches. Their wings glittered in the sunlight, winking, the wires so thin as to almost be invisible, as though an entire flock of them had chosen this moment to breeze by my window. I ran to the front door and wrenched it open so I could see it better. That’s when I noticed the neighbors walking through the butterflies and touching their sparkling bodies. “Isn’t it beautiful?” An older woman I’d seen a few times cupped a bright blue one in her palm. I moved up the path again. White butterflies with iridescent sparkle gave way to pale blues, then pinks and gentle yellows, moving to minty greens and lavenders that shifted to plum and fuchsia and deep red and sapphire. I caught a movement at the corner of the building and we all turned to it. Gavin stepped out, as beautiful as I’d ever seen him, fresh and combed and wearing a crisp button-down shirt loose over khaki shorts. “Say you’ll spend the day with me.” He backed away, giving me space. The setting was like a fairy tale, Gavin, looking so much like he had in high school, the trees and morning sun striking the glittering butterflies. A breeze wafted through, shifting the strings and making the bits of color dance among the falling leaves. I nodded; what else could I do? Each of these moments were new wonders, memories I could hold on to. Even if it all fell apart later, we would have this.